In this day excursion of Agra from Delhi, see the Taj Mahal. Travel in the comfort of an air-conditioned chauffeur driven car and visit the World Heritage Sites such as Red Fort, Sikandra – The Akbar’s Tomb and of course the Taj Mahal. Visit the Taj Mahal, one of the wonders of the world. Tour Agra’s Red Fort and its magnificent palaces. See Fatehpur Sikri - the abandoned capital of Mughal Emperor Akbar. Company of an experienced chauffeur. Agra is an iconic city in the north Indian state of Uttar Pradesh, famous for the mausoleum built emperor Shah Jahan for his wife which he named as the Taj Mahal. The majestic monument of Taj Mahal is one of the seven wonders in the world. Dotted with historic monuments Agra is a city which one must visit to understand its rich Mughal heritage. Your tour starts with a morning pick-up from your hotel or residence in Delhi / NCR city limits. You will be driven to Agra, which is a 4-hour ride. In the evening between 5.00 - 6:00 pm you start your journey back to Delhi / NCR. You will reach Delhi by 9:00 - 10:00 pm. What type of vehicles do you provide? We have two options Sedans & bigger SUVs. In Sedans we provide Suzuki Dzire, Toyota Etios mostly, sometimes it could be Nissan Sunny. In SUVs we provide Toyotta Innova, Mahindra Xylo, Suzuki Ertiga. You can request a particular model while booking in 'Special Request' and we try to provide it however you can not pick and choose exact car models. We operate only AC vehicles and hatchbacks are not available. Do I need to book in advance? Yes, all sightseeing tours need to be booked in advance. Tours often sell out so we suggest booking early to guarantee your desired tour day. Bookings are completely online and you can book on Website or Mobile app. 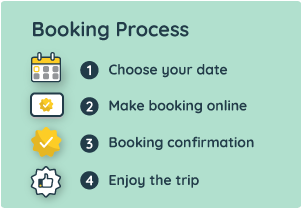 What is the booking procedure? You need to book online from this page. We accept only online bookings. Booking is confirmed instantly through SMS and Email. Driver & Cab details are sent on SMS/Email 3-6 hours before pick-up time. The driver will pick you up directly from your hotel or specified pick up point. Please enter the full pick up address at the checkout page.